Drop spindles! 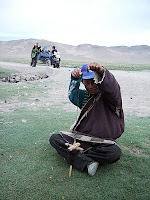 Of course you can spin wool into yarn with a spinning wheel (got to go round/drop all your troubles by the riverside...)!! But if you're learning to use a drop spindle, what you drop, along with your troubles is the spindle. And you drop it a lot. I never learned to use one, but the Roommate knows how; he is however, a bit out of practice. But he told me at his first class, there was little talking, but lots of clunking (spindles hitting the floor). Once again, we're back to why decorate something that is for utilitarian purposes? (I know why, but I get a kick out of it, so you'll probably hear about it again.) Sorry the photo isn't any better; you'll have to take my word for it. The spindles above are from: Ladakh, Laos, Oman and Thailand. The largest one, and the one on the bottom, come apart completely, I'm not sure why--for transport? They are all heavily used, very worn. They're simple, beautiful, and do the job (once you know how). 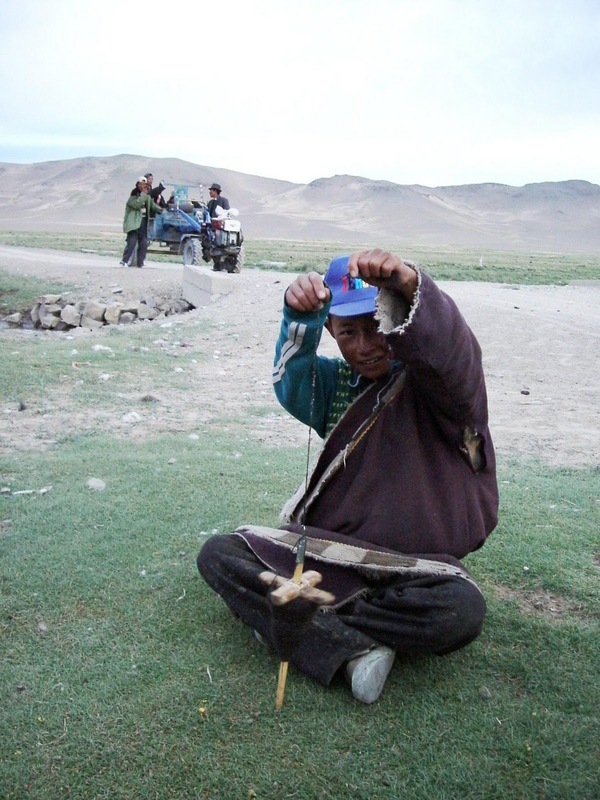 Here are two Tibetans using drop spindles somewhere on the road to Kailash. There are plenty of videos on youtube showing how to, and videos of spinners from all over the world. I don't want to discount anyone's spinning skills because I can't do it at all, but I was especially impressed with the women in Peru & Bolivia...they do it standing up & sometimes while walking (and we didn't see many sidewalks or paved roads when we were there). I can't even being to think how that works; I can text & walk, but I have to think hard and I only do it on routes that I take every day. If you've ever seen anyone spinning (with a wheel or a drop spindle), it's mesmerizing. I find it so relaxing. The old fairy tale about straw into gold? It's about magic--and when you see wool being spun into yarn, you'll realize you're seeing magic, too. And a skill that's probably at least 20,000 years old. More on that later. Thanks for reading and let me know what you think. Questions? Comments? BTW, the Met has an exhibit on Andean Huipiles (Tunics)! Unbelievable weaving & dying techniques on these masterpieces--some of them over 2000 years old. OK Kimono - and the fabric is Japanese women poets! Last weekend I started my kimono, which I've been thinking about for a while. I spent a lot of time translating the kimono pattern book, mostly just for fun, because I have a yukata & hapi coat that I can just look at if I like to see what pieces there are. BTW, I'm making a yukata really, which is a cotton kimono, for wearing in the summer. But if I tell people I'm making a yukata, no one knows what I'm talking about...whereas everyone knows the word kimono. What I really love about this fabric is that it's Japanese women poets--all reclining while writing. So, perfect for a house coat, huh? I'll have to perfect my reclining. I also like writing systems, and I know I probably bought it because of the writing on it--I can't resist that, and if you look at my old link about the kimono pattern book you'll notice that both my hapi and the Roommate's yukata have writing on them. My Japanese is nowhere near good enough to figure out if these really do represent actual people. Each drawing does have a chop (name stamp), so perhaps if I was more knowledgeable about the subject, I'd be able to figure out who they are. When I was doing the pattern translating, I discovered something I hadn't notice before. First, a little information: I hope you've been paying attention to recent posts about strip-weaving, because that's what the Japanese did too...traditional woven fabric is only about 14" wide. Generally a kimono is 4 strips wide (that includes the sleeves, and it takes 12-13 yards of fabric for one kimono, depending on the sleeve length (the really elaborate long ones are for young women & girls). Anyway, back to the pattern. On many of them there was no shoulder seam! They just used 2 very long strips for the front & back right side and the front & back left side. So I went & checked & my hapi doesn't have a shoulder seam, but the yukata does. In case you want to check out some Japanese women poets, here are a few of the very famous ones (they must be if I know about them). The first name is the woman who wrote the Tale of Genji, which might be the first novel, ever. I got their Kanji names from the List of Japanese-language Poets on Wikipedia. Shuttles! What's a shuttle?! A shuttle carries the thread being woven back & forth (much like the shuttle that carries me back & forth between work & the Metro station). In this video from Laos, you can see the weaver swapping between different shuttles to change the color & create a pattern. 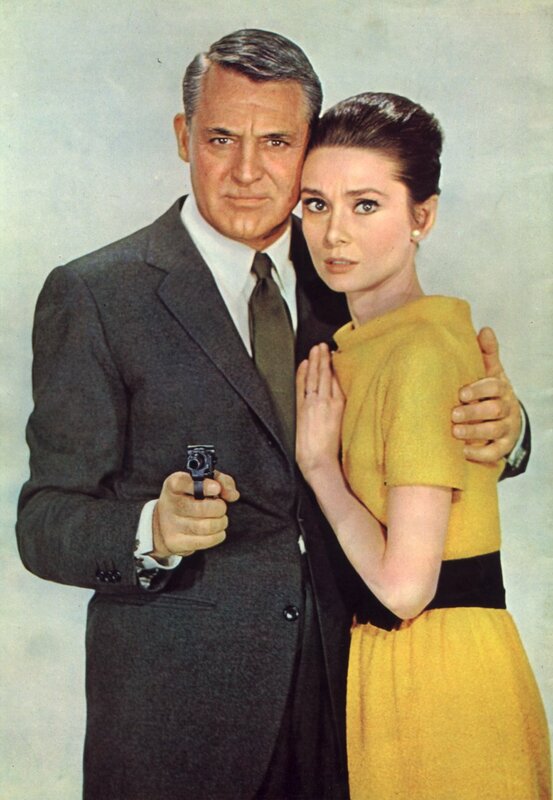 BTW, this was filmed near Luang Prabang, Laos, which is where we bought the fabric I showed on the previous post. You'll notice that the reeds on the looms are much like the ones we have, too. And look at these looms--they are just wood & string, but they make magic! So back to shuttles--aren't they gorgeous?! I love the different styles & shapes & the well-seasoned wood. The two darkest shuttles are from Laos (again, they're featured in the video). The two on the left are from the Czech Republic. Remember in the previous post I wrote that a loom is just a contraption made of sticks and string?! But the sophistication of this arrangement & the sophistication of the fabric that comes out of these looms never ceases to amaze me. 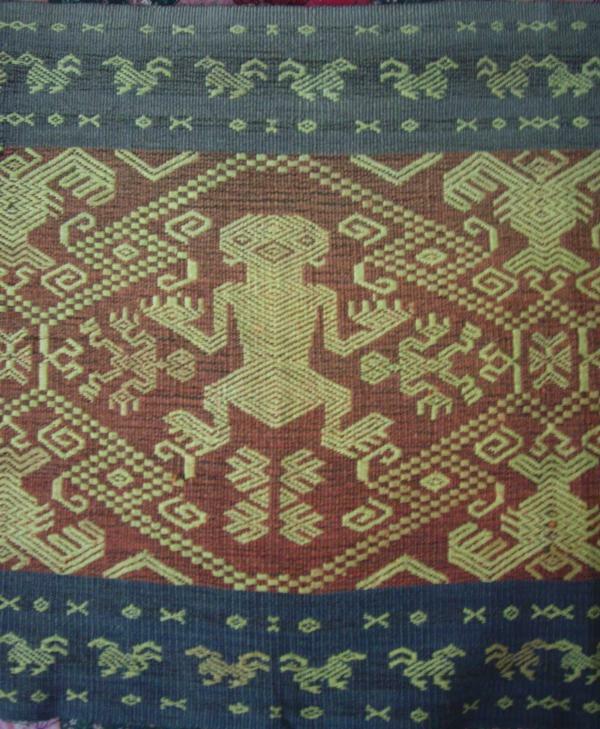 Here's a fine example of a shawl from Indonesia. I suspect that's the monkey king featured in the design. I do go on, don't I?! Some more Ghanaian textiles to the right...we took this at a shop in Accra. The wall is full of mostly Kente cloth, but also some Ewe cloth & plain woven items. The Ewe and Kente tend to be strip-woven, but now they have wider looms in Ghana, too, so that explains the less intricate patterns. I think we came home with seven Kente and 3 Ewe, plus quite a bit of other stuff, too, like masks and miniature coffins (see here for an explanation of why we needed a coffin model). However, our motto is We should have bought more! 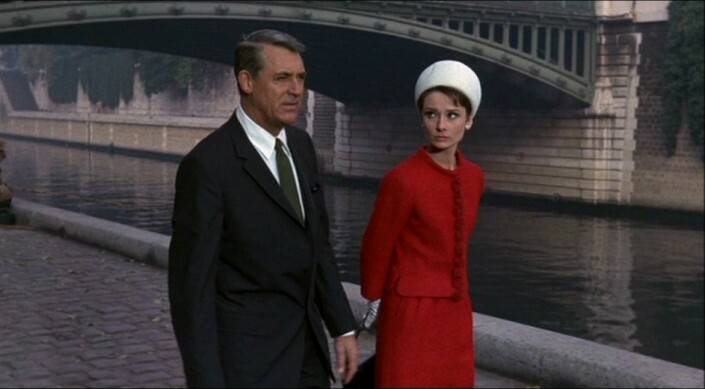 Here she is walking near Notre Dame. I love the suit--sort of Chanel-y! I might even consider the hat. Can you see the darts on this dress? Interesting using the thick fabric, which I think may be stretchy--so it looks like a sweater but fits nicely. I have a feeling that belt wouldn't go around one of my thighs! 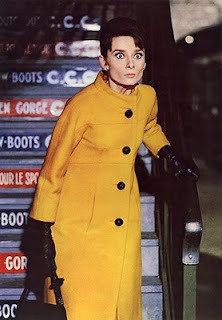 Another gorgeous coat. I could also stand to have someone style my hair every morning as I can only stand to spend 5-10 minutes on it. 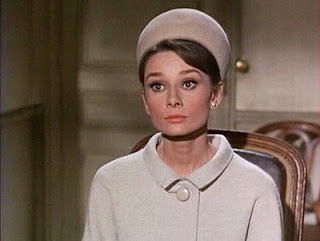 The soft shoulders and the collar seem so ladylike. I could not find a picture of her in this amazing cocktail outfit (top & skirt) which I love & would wear every day if I owned it. I had to get this photo from Christies website, where it fetched $US 303K in 2006. Many of the outfits in the movie are matching dresses & coats--and they are all great. Look at the boatneck! 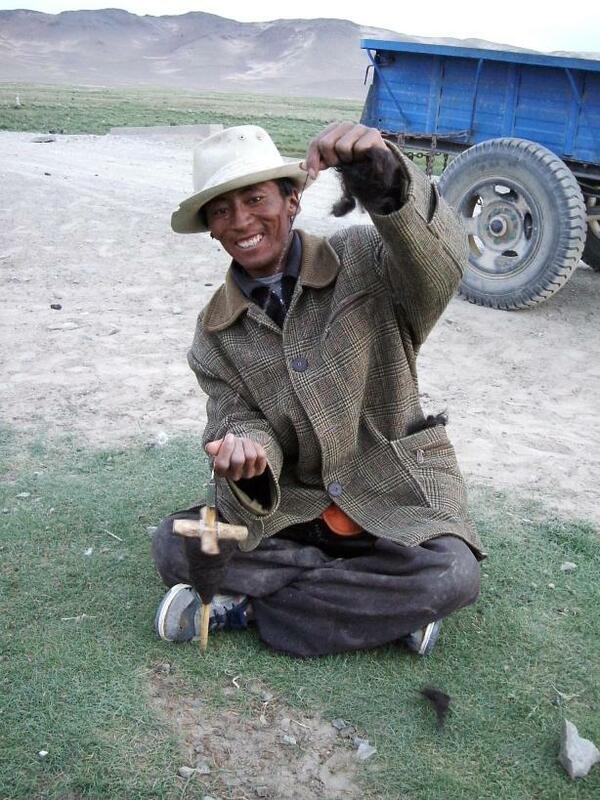 And the way the coat is cut. Best of all, it's a great movie, too, with lots of plot twists & turns and amazing scenery. 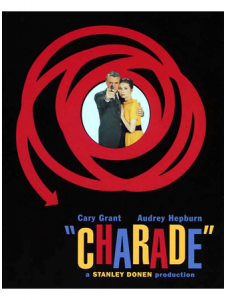 I keep forgetting to add music, but here's the Theme from Charade. Actually, it's the trailer; go check it out! In addition to collecting textiles, we collect items used to make textiles (especially if they're wooden!). I'll start off with items needed for weaving...drop spindles, shuttles & today, a back-strap loom and some loom pieces from Asia & Africa. One reason we are drawn to such items is that besides being utilitarian, they are often beautifully decorated, too. They don't need to be carved in different shapes or have any decoration, but they do. A great example is this loom (left) from Bobo Dioulasso, which has the hanging portion carved in the shape of a bird; I suspect this is from the Senoufo/Senufo people. As a birder, I found a hornbill loom impossible to resist. We're always amazed at how just a few bits of wood and string, if properly constructed can become a complicated loom. We've seen them all over being used to make beautiful and intricate fabric. In Africa the looms we saw weren't portable. However, in Laos and Latin America you often see weavers using backstrap looms--all you need is a tree or fencepost and your loom is ready. Here's a video of a man weaving in Cote d'Ivoire, on a loom much like this one. These looms are quite narrow (the resulting fabric is often about 6-7" wide, but some are even narrower). So what do you do with a very long piece of fabric that's only 6" wide? 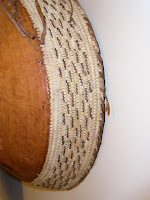 In West Africa, after strip-weaving, they sew all the narrow strips together, to great effect. I believe this first example, blue & green (above), is some Bondouko cloth. We bought this and another piece in Abidjan. It has an interesting strip woven effect, but is also embroidered--unusual on a strip woven piece. Embroidery is common, but on another type of fabric: that made with Adinkra, or stamps carved from gourds. In the video, the man is making plain white fabric--this is useful, too, especially for printing on with mud to make Bogolon or mudcloth (you'll have to wait to see our examples of that). Left, above: A strip we bought, basically just to show where Kente comes from. These strips, however, are sold all over Ghana as souvenirs. I can't imagine buying a strip, but not an actual piece of Kente; but that's just me. Below are some examples of Kente & Ewe, from Ghana, where geometric design & strip weaving come together to create true masterpieces. 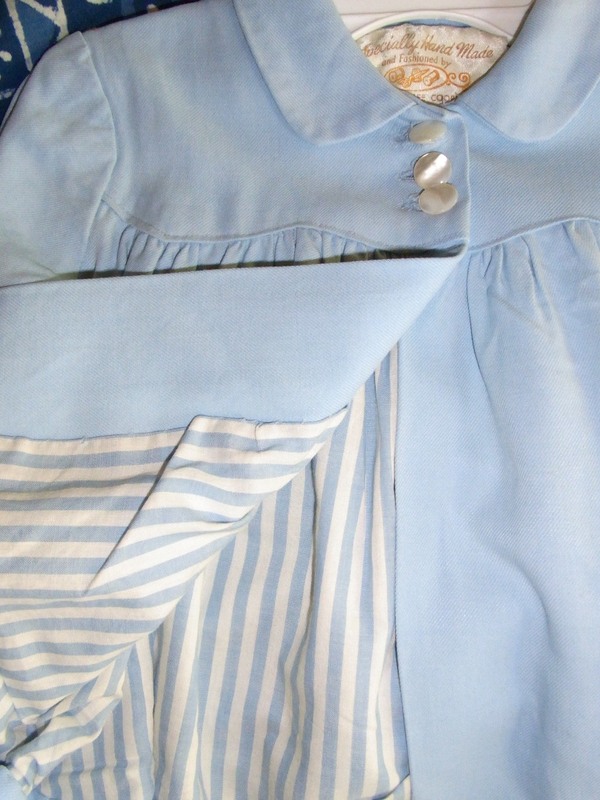 This first one is cotton & rayon (I think). Nowadays these items are worn for special occasions (we saw a few men in the villages wearing them, not often; perhaps they were officials, or on their way to a ceremony). To give you an idea of how this cloth is worn, here is an amazing photo of three Fante women, two wearing Kente, the standing woman wearing an Adinkra print, taken in the late 1890s. Strip weaving is a long process and requires a good eye and lots of work--these women were wearing their finest clothing, I suspect. This blue & white fabric (left) is Ewe, also from Ghana. The Ashante, who make Kente tend to use a wide variety of bright colors, while the Ewe tend to stick to indigo & white, with a healthy dose of primary colors to keep things interesting! I am pretty sure we only saw Ewe made of cotton. Back to the looms themselves: reeds look much like a comb and are used to pack the weaving tightly. 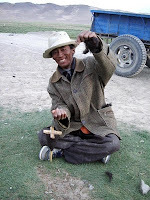 (In the hornbill loom, above, the reed is the brown wooden part.) Here are two combs from Laos. The top is just the comb, while the bottom is the backstrap loom, complete with a bit of fabric and 4 heddles. (Heddles are what makes the pattern.) You'll probably notice the pleasing shape of these; all of these have been used as decoration in our various abodes because they are so lovely. Here's a blog about backstrap weaving (an extremely portable loom). If you're wondering, the carpet under these reeds is from Aswan in southern Egypt. It's wool and another example of strip weaving, but with strips about 12" wide. It's yet another masterpiece we've been lucky enough to come across (and afford). More on carpets some other time. 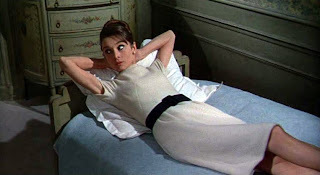 I'd love your comments; are you bored stiff? Should I go back to sewing? I realized last night that I'd forgotten to post some other molas we bought recently at an exhibit at the Quilt Museum in San Jose, CA. I like these because a) they're great and b) we know pretty surely how old they are (maybe!). The Kuna, native Americans who live on the San Blas Islands off the coast of Colombia (but are part of Panama), are artists. Textile artists, in fact, doing some of the most amazing & difficult handwork I can think of...reverse applique. I don't even like applique, much less reverse. So I thought I'd share with you some masterpieces collected by the Roommate's grandmother back in the 1960s and the item that got me thinking about this particular blog item, a gift from a Panamanian friend who lives in Abu Dhabi, but spent some time in her home country this past summer and sent me a beautiful present that she knew I'd love (she was correct!). 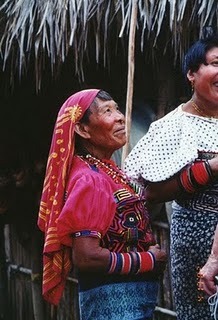 It is believed that molas (literally "clothing" or "dress") originated as body painting for the Kuna. When Europeans brought fabric, thread, needles & scissors (and Christian morals), the artistry was transferred to material and the women began wearing their creations. BTW, the Kuna are a matrilinear society; land transfers from mother to daughter & a husband moves in to live with his wife and her family after the marriage. I know you'll want to see what the women who make these look like, and how they wear them. I borrowed some pictures from Casa Coqui's blog. 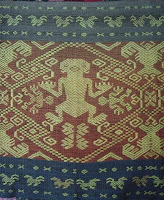 The molas are sort of like a bodice, then sleeves and the upper portion of the top are added on, usually in plain fabric. I love their elaborate leggings & arm coverings--they are beads, but are patterned to look like their intricate geometric molas! Take a look at the leggings this woman has on--at first glance they look like they are fabric, too. I think coming up with a beaded design like this must be at least as difficult as reverse applique!! You can read more in Karin Tice's book from 1995, Kuna Crafts, Gender and the Global Economy. Finally, here's a photo of the gift my friend sent me from Panama. It's a cosmetic bag & you can see why just about everything in Panama seems to have a mola on it now: it's bright, geometric & can be any size or shape. 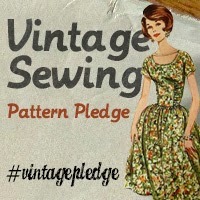 Let me know if you try out the reverse applique technique--and send me photos, too, please! Take a look at these items. Any guesses as to what they are? Here's a hint: if you had a camel, rather than a subway, train or car, you might need these. First of all, the round baskets are camel milk baskets! And the Tuareg camel bags are for transporting goods--much prettier than our suitcases. They are also leather & are decorated lavishly. Fringe, colored embroidery, paint & detailed leather work. We bought these in northern Burkina Faso at a market in Goram Goram. 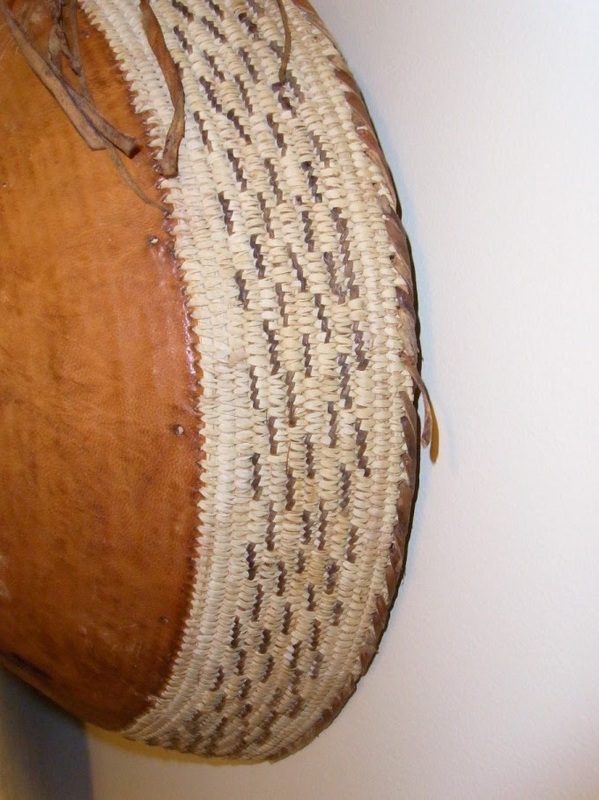 Check out Tribal Music for more Tuareg items. I especially like the rings! Wow. We didn't see much jewelry for sale in Goram Goram...it's really a market for the locals, not the tourists, so it was mostly farming goods, food, a bit of clothing and camels, of course! The Roommate & I love markets; we like to see what it's like to go shopping elsewhere. We are just as amused in a grocery store in the UK or Japan as we are in a market in Bahar Dar, Ethiopia, or northern Burkina Faso. What are the people buying and selling, what do they wear to the market? (In Oman, certainly, the women really dress up.) If you only see your friends 3-4 times each month, you'd dress up, too! We have been trying to get the new house decorated. Part of that involves treating it like a museum--we have boxes, most labeled in the basement, and we try to switch out our stuff so we can enjoy it all...hope you enjoy seeing all this, too! Once I got the basic idea down, it comes together quite quickly, without the gadget or even a pattern. I believe I mentioned that the Roommate & I collect children's clothing (women's, too) because it tends to be more traditional in terms of style & decoration (and certainly in terms of care). So often in places like SE Asia, Latin America, the Middle East, the men are wearing pants and t-shirts (which makes sense--these people work hard--why wear your fancy stuff to do manual labor?). 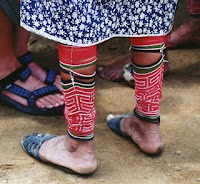 But the women & especially the children often are wearing the traditional decorated handcrafted masterpieces. So today, I'm proud to show you something from our collection...that was mine! My mom made this for me! 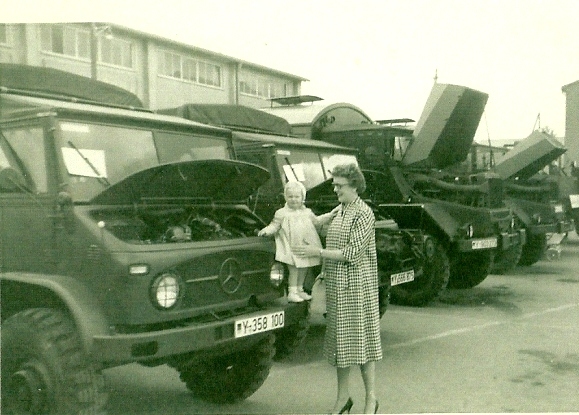 So there I am, with my mom, in Germany in 1963. And NO, my mom does not still have that coat! She made it, too, and over the years many people have offered to buy it; mods are especially interested in it! It hangs on our bedroom wall now (along with many other items from the collection that you've seen already). One thing we're always on the lookout for is old hangers; wooden or plastic, especially smaller, children's-sized hangers. My mom is an expert seamstress (though she doesn't sew much anymore) & you can see her hard work on these detail photos. I especially love the lining! PSSSSS...wanna see a documentary about Italian tailors?! Click on that link to make a donation ($25 minimum) to get the film finished. You can also watch the trailer there. When I was in ABQ we picked out the pattern & started shopping for the colors. When I returned home, I had the background & border fabric, plus a start on the fabric for the twisted pinwheels (see what the finished quilt will look like--6 bunches of 4 twisting pinwheels with a narrow & broad border). I also had the paint samples my mother had used. If you look closely at the quilt, you might notice that those 24 pinwheels have 14 different fabrics, so it's a fairly scrappy quilt. I wanted to get that variety into this quilt, so went to Hancock Fabric today (which I can't believe I never found before--it's closer than JoAnn!). Hancock also happens to be very close to a big hardware/home improvement store--so everyone in the family can be happy with one 3.5 mile drive down Highway 1. I found 4 more greens that will work with the paint samples I was sent home with; we had trouble finding the greens in ABQ, though the turquoise & reddish/orange fabrics were easy to come by. I also decided not to use the actual gadget that came with the book my mom found the pattern in...it's quick & easy, but wastes a LOT of fabric. I can't stand that--because any leftovers will get added to my stash! So after a few tries and lots of sewing/unsewing I figured out how to use almost all of the 5" block, rather than lose about 25-30% of that block. To give you an idea, according to the book, a 5" block would end up about 3.25". But my version ends up w/ about 4.5"! That's using the 1/8" mark on the quilting foot. I like the way the test square came out, but it definitely demonstrates one of my weaknesses: although I consider myself quite visual, I'm not so good at shades. So, the 2 lighter shades, which look pretty different in person, really blend into a double-twisted-pinwheel-blob because they're not different enough. I will definitely get the Roommate to assist with this--he's good at the different shades. In fact, the biggest quilt I ever made (my 2nd) was all sorts of blues & greens. I had the washed/ironed fabric on the back of our futon--and he put them in order by shade gradation, so when he wasn't around I could still keep the quilt going. It was a good test run, though, and I only need to make six of these squares...this first one took a few hours, so obviously, if I put this one aside as a lesson, I haven't wasted that much time.